This Ferrari model is not as popular as of the Enzo or the F series introducing the Ferrari 612 Scaglietti Exotic car which was named after Sergio Scaglietti in honoring him for his stylish designs made in the past for Ferrari, this model offers a 2 door 4 seater layout, this exotic car isn't loved by everybody like the Enzo because of an unsatisfied design I guess which I find hard to believe, but no matter how much criticism this car gets you can never take away the comfort and convenient this car has to offer over the sportier type Ferrari's out there, Ferrari 612 Scaglietti is the friendliest supercars Ferrari has to offer as of this moment, why? because Ferrari 612 Scaglietti has the room no other Ferrari model has, it probably is even roomier than some its competitors like the Aston Martin's DB9 which we consider the back seat as for design use only, this Ferrari's back seat can comfortably fit a fully grown 6 footer. Well we should face it Ferrari 612 Scaglietti isn't the best sports car out there right, but I think this exotic car isn't made to be the best sports car but rather it's made to be an all around car of Ferrari, meaning you can have the looks the performance of a Ferrari sports car and get the comfort and convenience of a luxury car in one, which makes this model unique over the other Ferraris. 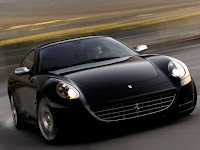 And just because its not the best sports car out there it doesn't mean you can easily blow by it, Ferrari 612 Scaglietti is actually the second most powerful Ferrari out there coming behind Enzo, this exotic car is powered by a 5.7 liter V12 engine that can produce a monsterous 540 horsepower @ 7250 rpm and a 434 lb ft. of torque @ 5250 rpm that is transmitted through an either 6 speed manual paddle shift gearbox or a 6 speed automatic gear shifting mode and with the use of the aluminum space frame and body which cuts down the weight. 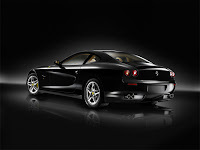 Ferrari 612 Scaglietti performs an excellent acceleration of 0 to 60mph in 4 seconds and can blast to a top speed of 199 mph before you even catch a breathe.